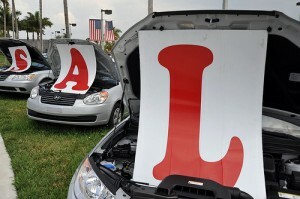 7 Ways To Save At The Car DealershipEliminate The Muda! Profit margins on car sales have fallen over the last several decades and dealers will likely continue to face ever narrowing margins considering newer business models like Saturn and Scion’s one price approach. These dealers are forced to selling cars at a fixed price that limits profitability. Traditional dealers have also faced diminishing margins and look to add other products and services to make up the difference. We are all being sold at every turn: “want a cherry pie with that hamburger?”, “interested in an extended warranty with this television?”, “how about Office Pro with your new PC?” Dealer are often no different, from the moment you arrive they are thinking about how to up-sell you. Pinstripe – 3M sells rolls of pinstripe that will cover 10-15 cars for less than $30 retail. It takes an experienced person less than 10 minutes to install but some dealers will charge $175 or more! Rust proofing – Years ago this was common and some would say necessary. Cars have changed, the metal if often treated chemically, technology has improved and rusting is just not the concern it once was. I’m not sure of current costs. It used to be less than $30 in material cost for the dealer about a half hour to install but they would sell it for anything from $200 to $500. Undercoating – Similar issues as above, most cars have some form of undercarriage protection from the factory. Paint Protection – Admittedly there is some controversy over this one. Some say that any chemical application is sure to wear off in short order. Others believe that these “Teflon” coatings truly do work. If you believe in them, just purchase the product and apply it yourself. You’ll save hundreds if not thousands. Fabric Protection – 3M Scotch Guard is wonderful and works well. Buy a can for a few dollars and use it every 6 months or so. Again you will save hundreds over paying the dealer to do the same thing. Glass Etching – As a theft deterrent some dealers etch a serial number on each piece of glass, often costing $200 or more. Do you really think most thieves are going to pull out a flashlight to check for this miniscule writing? A bottle of glass-etching acid and templates can be purchased for less than $40. Extended Warranty – If you must have the “peace of mind” I would suggest looking into buying a policy directly from the insurance carrier, there is no reason to allow the dealer to make commissions for just pushing the paper. Also, look very closely at what is really covered. Many consumers have purchased “bumper to bumper” warranties that hardly covered the two bumpers! Most would agree however that extended warranties are rarely worth the money. The quality of cars is much better today than years past and factory warranties last much longer. Better yet, don’t buy a new car at all. Let someone else take the depreciation on the vehicle. Purchase a “previously loved” car, 2-3 years old with low mileage.